We offer a complete 3D-printing solution to Life Science businesses and Universities for printing biological macromolecules. Bringing a molecule to life as a high-resolution model that can be handled and explored, greatly aids understanding and appreciation of molecular shape and function. Our 3D models offer a hands-on way to show how molecules interact and how biological and biomedical processes occur. The models are durable, long-lasting and in addition to their use in demonstrations, lectures and practicals, can be used to aid the impact of science communication, research grants and public engagement talks. 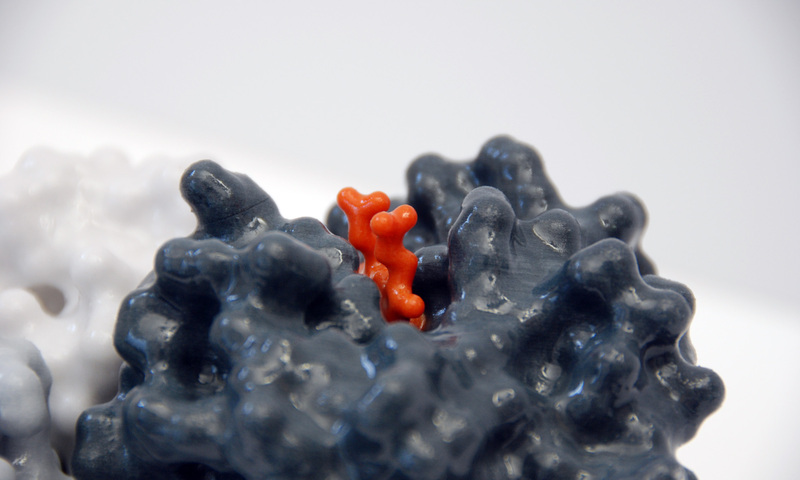 We would be delighted to help bring your favourite molecular structures or PDB codes to life! Please have a look at our gallery of previous models and register your interest on the Your Model page. We can print absolutely any molecular or cellular structure. This can include primary, secondary, tertiary or quaternary protein structures; any molecule with a PDB code; DNA, RNA or protein structures; co-crystals; sugars, lipids, ligands, cofactors, coenzymes, small molecules, chemicals, metabolites, organics or drug interactions. We can also print intracellular structures such as organelles, protein-lipid bilayers, enzyme pathways or reaction centres. We can work with any data from X-ray, NMR or cryo-EM sources. As well as glossy full-colour printing, we can include magnets to allow models to be composed of several pieces that ‘click’ together (e.g. protein-DNA complexes or multisubunit proteins). We can also design and make attractive stands or display units for your models as well as bespoke packaging to store them safely.